(Nanowerk News) Aptamers are composed of short RNA or single-stranded DNA sequences that, when folded into their unique 3D conformation, can bind to their targets with high specifi city and affinity. Although functionally similar to protein antibodies, oligonucleotide aptamers offer several advantages over protein antibodies in biomedical and clinical applications. Through the enhanced permeability and retention effect, nanomedicines can improve the therapeutic index of a treatment and reduce side effects by enhancing accumulation at the disease site. However, this targets tumors passively and, thus, may not be ideal for targeted therapy. To construct ligand-directed “active targeting” nanobased delivery systems, aptamer-equipped nanomedicines have been tested for in vitro diagnosis, in vivo imaging, targeted cancer therapy, theranostic approaches, sub-cellular molecule detection, food safety, and environmental monitoring. A new review paper in Small ("Aptamers and Their Applications in Nanomedicine") focuses on the development of aptamer-conjugated nanomedicines and their application for in vivo imaging, targeted therapy, and theranostics. 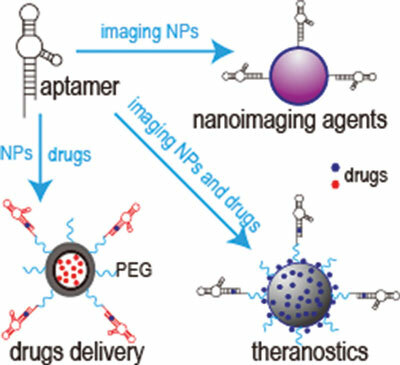 The development of successful aptamer-based nanomedicines is contingent upon several multidisciplinary considerations, such as the nature of the disease, the aptamer structure and biochemical properties, and the selection of appropriate nanomaterials and drugs. Specifically, some important parameters that must be considered are: 1) how can aptamers be modifi ed in order to maintain the correct conformational structure on the surface of nanoparticles? 2) How many aptamers should be conjugated with each nanoparticle to achieve effective binding with target cells? 3) How will the size and shape of the selected nanomaterials affect the nanomedicine biodistribution? 4) Can the preparation method be easily and cost-effectively scaled up for industrial production? How can we rapidly select an aptamer with high specificity and affinity to the disease-relevant targets? How can we improve the biostability of an aptamer for in vivo applications? What are the best strategies for the aptamer to achieve effective drug delivery? How can we improve the physicochemical stability of different nanomaterials when the specific nanomedicines are prepared? How can we reduce the toxicity of different nanomaterials for in vivo applications, especially for non-degradable nanomaterials? What are the exact mechanisms of nanomedicines working in vivo?